The first step to improving your situation—in anything—can be expressed simply as “know thyself.” You cannot progress beyond your current state with the same thoughts and actions that brought you here. Therefore, only through constant self-evaluation will you unlock the secrets to incremental improvement. For instance, you must actively distinguish what works from what does not work, as well as be able to recognize what you need to learn versus what must be unlearned. Often the key elements are not obvious or clear, but you must accept that life is subtle—only through improving on the little things will you succeed in the big things. In climbing, the process of improvement begins with getting to know your patterns at the crags, in the gym, and in your everyday life. You must become aware of your climbing-related strengths and weaknesses in each area of the performance triad—technical, mental, and physical—and learn to leverage your strengths and improve upon the weaknesses. Toward this end, your prime directive must be to train intelligently—that is, to engage in training activities that best address your weaknesses, while not getting drawn into the trap of training as others do. Of course, a clear understanding of your mega goals in this sport is equally important to achieving success. Only with a clear goal in mind can you take consistent actions that keep you on route, as well as have the sense to recognize when you have wandered off route. Finally, at the very deepest level, you must closely examine your level of commitment to climbing—are you willing to make the sacrifices necessary for reaching your mega goals? Self-Assessment Test: The Breakfast of Champions! Example of Post-Test Plot of Scores Shows Strong Mental and Technical/Tactical Skills, but Lagging Physical Skills Require Targeted Training. While an in-depth evaluation by a veteran coach is ideal, living with intention and thinking critically about your climbing and training can make you an effective self-coach. Frequent video analysis of your climbing will provide important clues on how you can improve technique and tactics on the rock. Still, some fundamental mistakes and weaknesses are so subtle that they are not easily observed by others or by viewing yourself on video. This is where a detailed self-assessment test comes in handy. As featured in the 3rd edition of Training For Climbing, this online self-assessment test can be extremely helpful, especially for beginner and intermediate climbers (though it may lack the nuance to offer much guidance for some elite climbers). The results will reveal your true (not perceived) strengths and weaknesses—and possibly even an unknown Achilles’ heel that must be addressed if you are to ever reach your potential (or break through a performance plateau). With this knowledge, you can create the most effective training program for the climber you are right now! In taking this online assessment, it’s important to read each question once and then answer immediately based on your recent experiences on the rock. Don’t read anything into the questions; nor should you try to figure out their focus and shade your answers in any way. Upon completely the assessment, you’ll see a score plot (like above) and you’ll have the option of downloading your results (PDF file) for future reference. 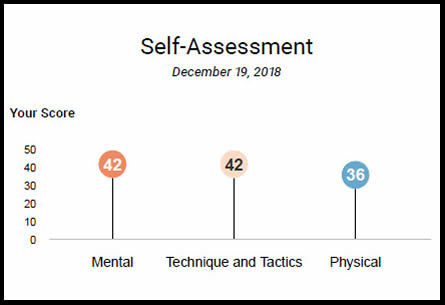 Comparing annual self-assessments is a powerful way for beginner and intermediate climbing to track long-term improvement in each area of the performance triad.